I've spent far too much of my morning looking at recipes online. Its a combination of feeling constantly hungry today and having that urge to try out a bunch of new recipes. Oh, and maybe that it's the first day of summer today, that might have something to do with it. Happy solstice! The longest day of the year! Visions of zucchini and fresh tomatoes dance in my head. Chopped Tomato Salad With Toasted Garlic — Believe it or not, Martha Stewart's site has a lot of great recipes for vegans, and a lot of vegetarian recipes that are easily veganized. The best part to me is that the recipes generally aren't unhealthy, something that can be a problem with magazine-type recipe sites. Chickpea and Tomato Salad with Fresh Basil — This seems to look a lot like the last recipe, and maybe it is, but who cares? Really its two totally different salads, aside from the tomato base. Yum! Pinto, Black, and Red Bean Salad with Grilled Corn and Avocado — This looks like pretty much the most amazing thing ever, doesn't it? Oh my goodness. I wish I had time to make it tonight, in fact, but I don't. Look for a review of this recipe in a near-future post. 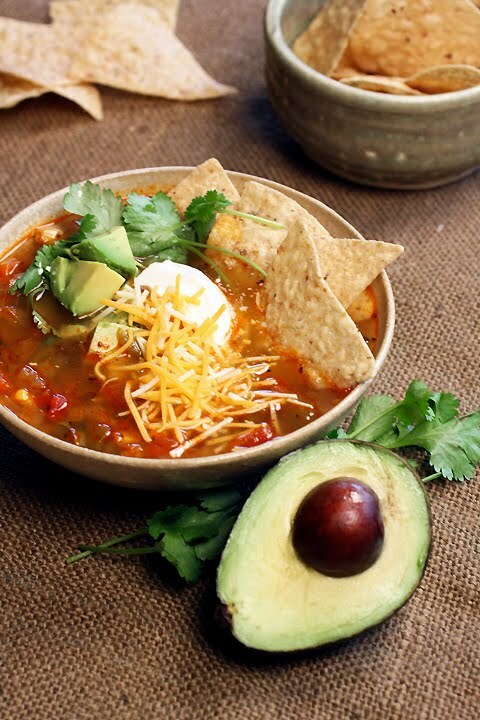 Spicy Vegetarian Tortilla Soup — This is another one that I printed out right this very minute. I've made tortilla soup before, but it was fairly unimaginative, and not chock full of veggies like this one. I wouldn't include the cheese or sour cream, obviously, but the avocado and tortilla chip combo more than makes up for that in my opinion. This is another one I'd love to make tonight, and that you will be hearing about soon.